So I saw some really cool shows a few weeks ago. The Airborne Toxic Event, along with their uber-classy pals The Calder Quartet, blessed the East Coast with a handful of magnificent concerts. Part lush string arrangements and heartfelt ballads, part good ol’ sweaty and leaping around like monkeys rock ‘n roll. I’m hard pressed to come up with superlatives that I haven’t already used (in great abundance) in connection with Airborne Tox. Because, you know, I’ve written about these guys a few times before. If it’s ok with you, I’m going to combine the shows I attended – Somerville Theatre, Kewsick Theatre, and New York City’s Town Hall, plus a movie night with some good friends at an old Yiddish theatre on the Lower East Side. It was a magical and spectacular road trip holiday with some of my favorite music as the soundtrack. 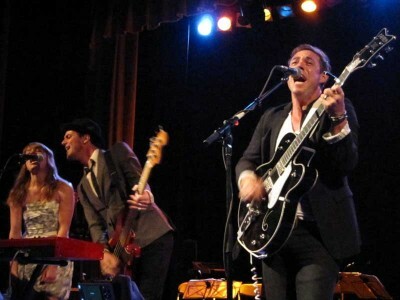 The Airborne Toxic Event at Somerville Theatre. Much more of this sort of thing coming soon. Hello, strangers. 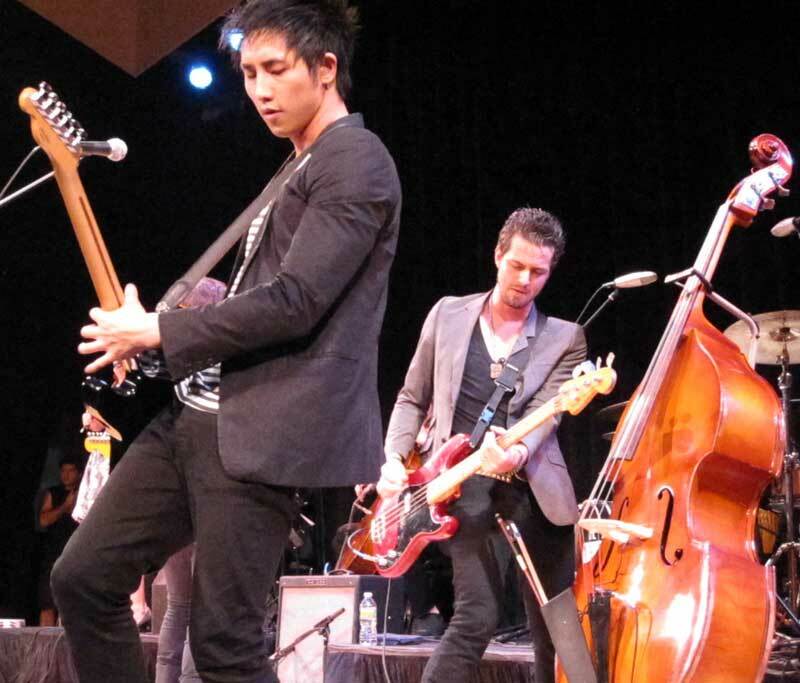 Slowly returning after being pummeled with various work duties and hot on the heels of a brief but beautiful holiday with The Airborne Toxic Event – and the magnificent Calder Quartet – (details of which should be appearing by the end of this weekend). For now, you can see my review of the inimitable Iggy and The Stooges at the House of Blues a few weeks ago – it’s up on Ryan’s Smashing Life, and as a prelude to my Airborne coverage, check out some video from the lovely Somerville Theatre on my YouTube channel (where you can find bucket loads of Airborne Tox videos and other really marvelous bands filmed over the past few years). This weekend, there’s quite a few Boston bands of note performing all over the place. Tonight there’s an odd and interesting “BBCU Presents What’s Your Major 2 Comedy and Music Festival” at Church of Boston, featuring many cool local bands such as Kingsley Flood, Do Not Forsake Me Oh My Darling, and Ad Frank. Then there’s “music and a movie” at Cafe 939, with the premiere of the award-winning film The Why and Walter Sickert and the Army Of Broken Toys. Also on Saturday, Mighty Tiny are playing at the “Alice Vs. Wonderland Afterparty at the American Repertory Theatre in Cambridge. On Sunday, Jaggery will be performing with Ember Schrag at the Whitehaus Gallery in JP [apparently it’s at a secret location, and you have to email The Whitehaus Family Record for more info]. And also on Sunday, the original lineup of Come plays at T.T.’s. On this week’s Expanding Awareness program, Victor and his guest will be discussing The Disclosure Project – an effort to have world governments disclose what they know about UFOs. This happens at 10am on WZBC 90.3 fm. You can also listen to the show online or after the fact on the WZBC Archive (all of ‘ZBC’s shows are online for two weeks). 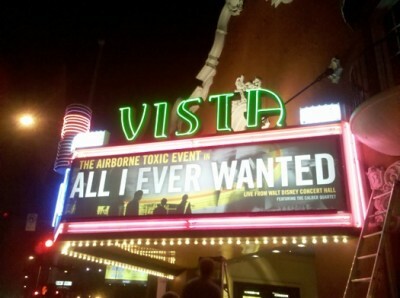 All I Ever Wanted: The Airborne Toxic Event Kicks Off Their Film Premieres and Acoustic Tour Tonight in L.A.
Tonight's film premiere is at the Vista in Los Feliz, Los Angeles. The Airborne Toxic Event are poised to begin their special acoustic tour with the impossibly classy Calder Quartet to commemorate the release of their live DVD and documentary, “All I Ever Wanted: Live From Walt Disney Concert Hall”, which follows the band as they prepare for that epic Los Angeles performance which featured – in addition to the string quartet – a children’s choir, a high school marching band, horn players, visual artists, and traditional Mexican folkórico dancers.